I haven’t met a mom who wouldn’t consider themselves busy or stretched thin. From being a working mom, to a stay at home mom to a working at home mom we all have so much going on. If you consider yourself a busy mom or are pregnant and trying to plan for what’s to come here are some tips. Jump in your car and head to Target, I know twist your arm right? As you know, at Target you will find water, food and organizational items. Everything a busy mom needs to survive the day! Water is going to keep you hydrated and when you are hydrated you can think for clearly and are less likely to be cranky. It can also help you lose weight because you might think you are hungry but really your body needs water. Staying hydrated can also work as an appetite suppressant and give your skin a healthy glow. Water helps you flush out waste and bacteria. Not to mention water is needed to help circulate nutrients around your body! So guys, drink water.. a lot of it! Organize the diapers bag and re-pack it every night or once a week at least. Get the car organized as well! I have a bag in the trunk with extra diapers, a portable potty, extra wipes, change of clothes etc. Being organized allows you to use less energy during the day while mommin’ because you won’t be franticly looking for something. Mommy’s need snacks too, not just toddlers. From changing diapers, to potty training to playtime, running errands and more. Moms need to eat during all the many jobs that come with motherhood. For the new year I told myself that I would do my best at snacking healthy. 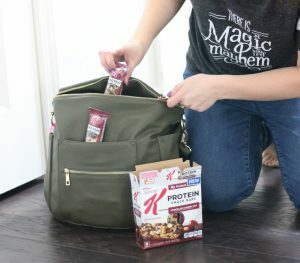 As a mom I don’t always have time to prep snacks so I’m so glad New Special K® products are the ideal on-the-go snack. 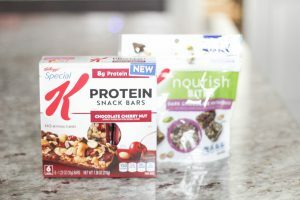 They have new K Nourish® Bars and Bites and the NEW Special K® Protein Bars and Bites which are perfect to throw in the diaper bag, because let’s be honest you are not the only one who needs snacks. 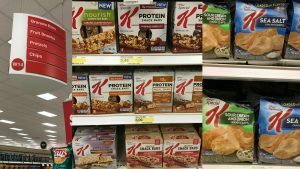 Where can you find these goodies in Target? 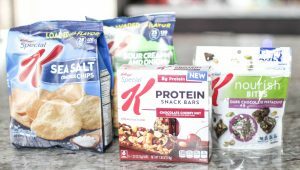 Here are my current favorite snacks from Special K®. 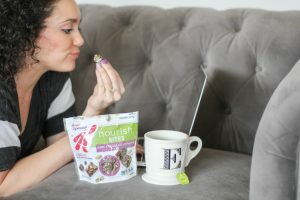 THE BITES: These snacks are convenient because they are bite size that are great for On-The-Go or when you are laying on the couch trying to get some work done. My favorite bite flavors are the Dark Chocolate Pistachio and Peanut Butter Chocolate. THE BARS: Snacking perfection! NEW Special K® Protein Bars are filled with wholesome ingredients and totally reach my sweet craving needs. There are currently two new bars out Nourish & Protein. So what makes them different? Well they both have different ingredients to change up flavors and textures, but the Protein Bars have 8 grams of protein. The Chocolate Cherry Nut and Chocolate Almond are my Favorites! 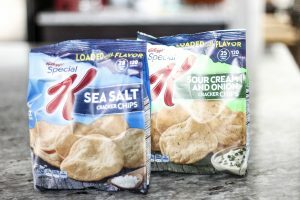 THE CRACKER CHIPS: There are going to be times you are not craving sweet, but you need that crispy, crunchy or more savory snack. 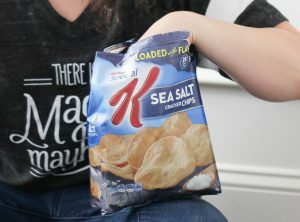 Special K® crackers and chips help me to satisfy those salty cravings with less guilt. For more Kellogg inspiration, check out THIS LINK! Love special K protein bars!! Drinking more water throughout the day is a goal of mine. I’ve been doing really well and it makes all the difference in my mood and energy level! Great tips!! I’m headed to the store now and I’m definitely going to try those Chocolate Cherry Nut protein bars, they sound yummy! Thank you Danielle, we definitely all stay so busy! Organization and easy access to healthy food is a must! So yummy! I am always looking for a new healthy snack! Special K is so good! Loved this post!